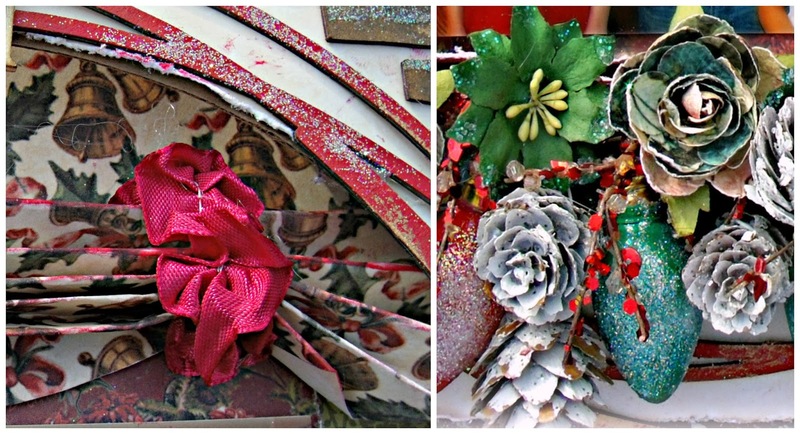 lifetime of pages: First Pages with the C'est Magnifique December Kit! First Pages with the C'est Magnifique December Kit! 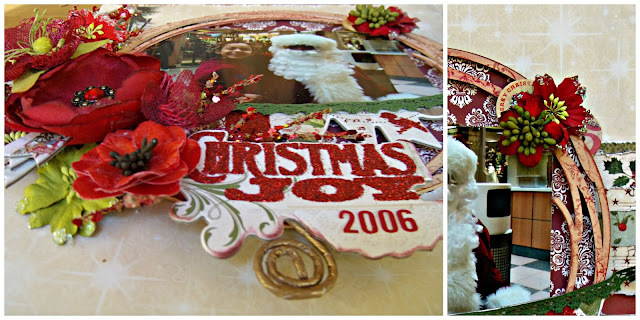 I am first up to share my pages created with the magical and nostalgic C'est Magnifique December Kit! Anyone who knows me,knows that I love Christmas (all year long!) so I always look forward to the December Kits and this one exceeded my expectations! My first page was inspired by my Wal-Mart pizza box! It struck me as looking in a window so I used the box as the base for my very 3-D creation,"A Window in Time". I pleated my "curtains" by inspiration from Gabrielle Polloco and added the Webster's ruffled ribbon. 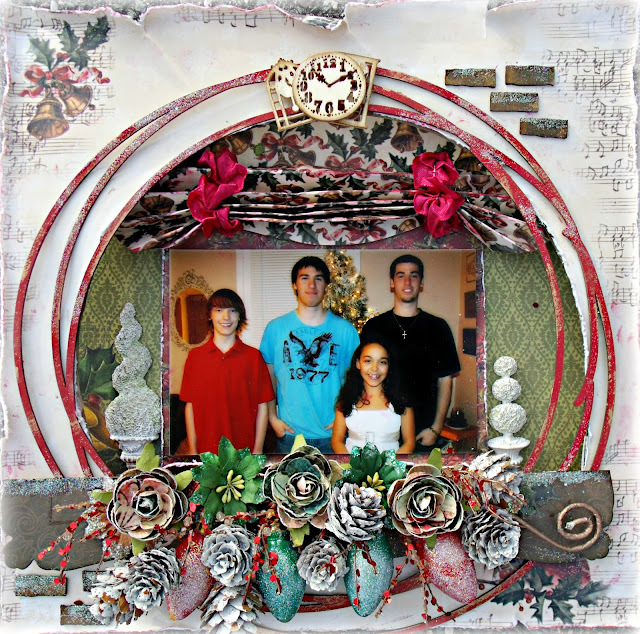 A gorgeous Cardinal red ink by Versa Color is included in the kit and I used it to ink the fun Blue Fern circle frame. My window "box" came from a Kaisercraft frame. The pinecones were picked in Vermont and gessoed. The vintage light bulbs were a discovery at my church's bazaar. I modge-podged and glittered them.Well, I kind of glittered a lot of the page and it looks pretty and glistening in real life! 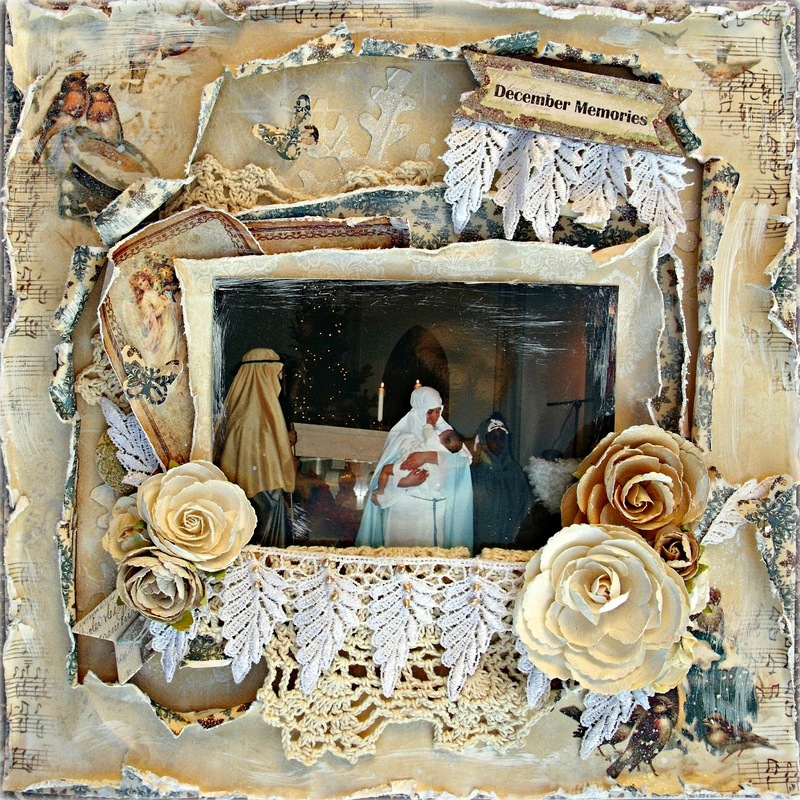 My second page focuses on the quieter, spiritual side of Christmas and the lovely ivory neutrals in the kit. The baby Jesus in the photo is my daughter, Naomi in the Christmas pageant. If you look closely her little hand is reaching up to touch "Mary"s cheek. Can I tell you there wasn't a dry eye in the Church? Because she was still at the foster care status, I could not put her last name in the program and she was listed simply as "Baby Naomi". A sweet parishioner actually wrote a letter to the editor about how she was moved by Baby Naomi.It was a very special Christmas! How gorgeous is this lace? I draped it over a dollar store doily and used it as a banner with one of the many die-cuts in the kit. 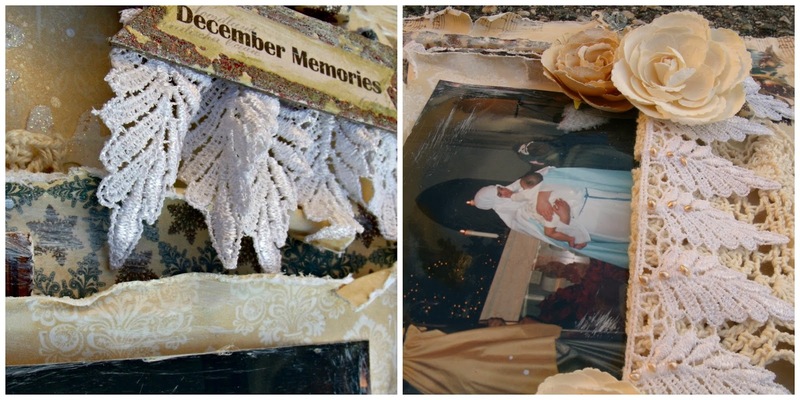 Lots of distressing,tearing and gesso complete the page! My last page for today is just about the sweetness of a 5 year old and a kindly mall Santa who took the time during his break to chat with her. Everything on the page is included in the kit and add-ons. I randomly punched the edges with a Martha Stewart star punch before hitting the edges with my Zutter distresser. The Blue Fern circle chippie was painted ivory and stamped with a Something Tattered design stamp. I hope I brought a little Christmas cheer your way! Wow these are all so beautiful.. lots of details, beautiful photos and love the flowers and laces and paper folding you have on these layouts.. feeling very festive now after seeing these.. beautiful work! wow your layouts are gorjuss - and the photos are so special too. Christmas really is on its way. These are all incredible! I can't wait to see what else you create with this kit! Beautiful work, as always, Tracey! You are an inspiration! Oh my word.. These are AMAZING!! love the colors of each one..
WOW Tracey! these pages are absolutely stunning. I love the photos you used - wonderful memories to scrap. And your layouts are always so full of your wonderful creativity and beautiful designs. Thanks for helping to put me in the Christmas spirit this morning, too! Wow Tracey...I just saw these layouts on the Inkido blog and I love them all. But the second one(december memories) just made me speechless. Wow, so beautiful!! Your layouts are gorgeous, Tracey. It's such a blessing to have you share these lovely projects in our challenge. It's wonderful to see your creativity and I thank you for stopping by to play along. Hope you're having a blessed week!